Having a small bathroom needn’t be a problem. With the right design and some creative thinking you can make optimal use of the space. It’s important to assess not just how you want the bathroom to look, but also how you’d like it to work. Are you looking for a dramatic eye-catching feature room, or a calm, spa-like place to unwind? If there are several members of the household, how will the design meet everyone’s needs? Once you know what you need, here are your design for small bathrooms essential tips. So you can create a beautiful, functional space, whatever the size. It’s common knowledge that white adds a feeling of space to a room and will reflect light back into even a poky space. You might want to install a white bathroom suite and run white through the room, from tiles to walls, for a clean, minimalist look. If that feels too stark, consider using grey grouting and wooden fixtures and fittings to add some warmth. Or you can include pops of colour with accessories or towels. Using the same neutral colour or material on walls and floors will create the illusion of space and a natural flow. You can also achieve this effect by using the same tiles on the side of a bath and up the wall behind, so your eye is fooled into thinking it’s one solid line. 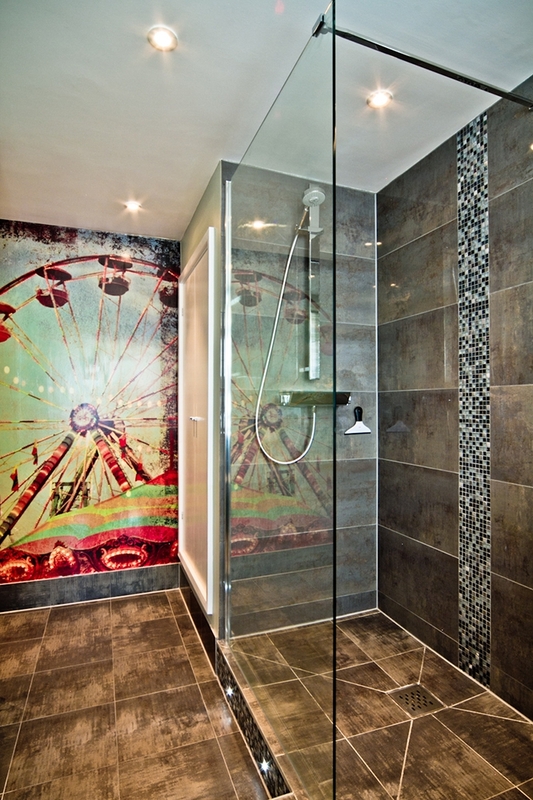 If you prefer a bold, colourful look then a small bathroom offers the perfect opportunity to play with colour. In a narrow space use blocks of contrasting colours or unexpected tones to distract from the size of the room. 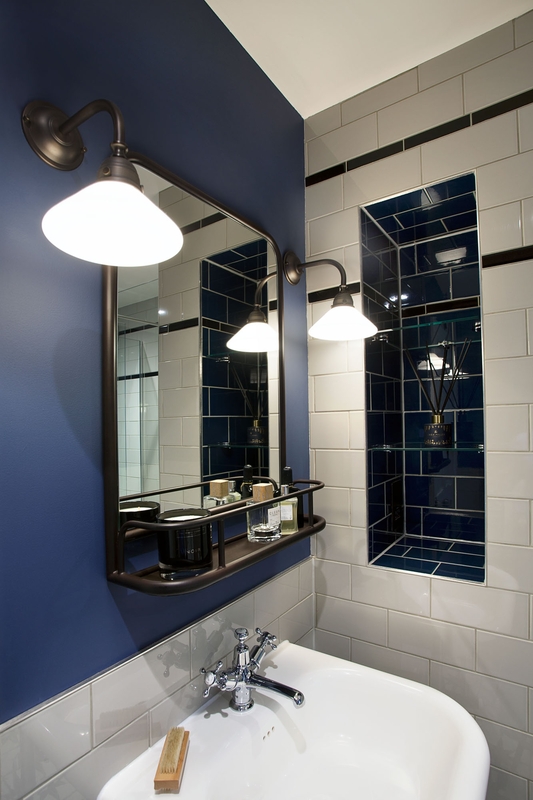 Set a black marble counter against white tiles, or use vibrant electric blue tiles to offset gold taps. Bottle greens and sunny mustards will add warmth whilst retaining a classic feel, whilst pastels and brights bring a contemporary vibe. An expert designer can eke out every last centimetre of space in a small bathroom. Clever use of bespoke furniture and fittings, or adapting existing items, can create a functional, great-looking room. But first think about just how much of that bathroom clutter you really need. If you’re short on space be ruthless about accumulated bath products and stray candles. Once you’ve established your must-haves, you’ve got various options for bathroom storage. Floating vanity units and shelving create space underneath, which can either be used for more storage or left free, leaving easy access for cleaning and also giving the impression of more space. Wall-mounted taps and toilets also save precious space as well as looking modern and sleek. Towel warmers can double as towel storage, and medicine cabinets can hide grooming products and toiletries. Think about multi-functional furniture and things you can take out of the room when not needed, like baskets. Just as with colour, adding texture to a small bathroom design can create a striking space that celebrates its smallness. Bold wallpapers with large patterns (either varnished or specially produced to withstand moisture in a bathroom) look fabulous in cloakrooms and bathrooms. Using light is a brilliant way to introduce a sense of expanse. A well-positioned mirror will bounce back natural light into the room, whilst task lighting near mirrors, above cabinets and in alcoves will keep things bright. Illuminate dead or poky spaces with hidden LEDs in-between fittings and furniture. 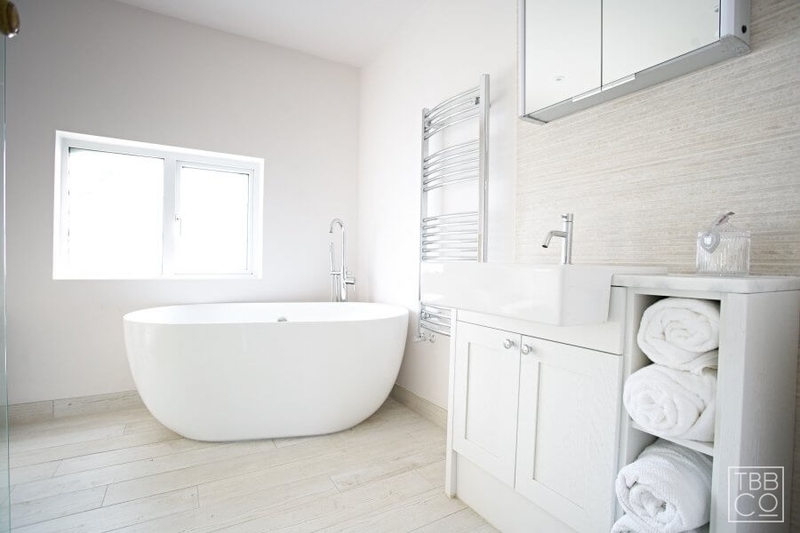 There are many tricks you can use to maximise the space in an awkward space or small bathroom. Recessed shelving and alcoves provide storage and display areas without protruding into the room. Hide storage units behind tongue and groove panels and use the shelf on top as a place to keep bottles and plants. If your ceiling is sloping, position the toilet under an eave, or add vertical wooden panels to create long lines that create a sense of extra height. 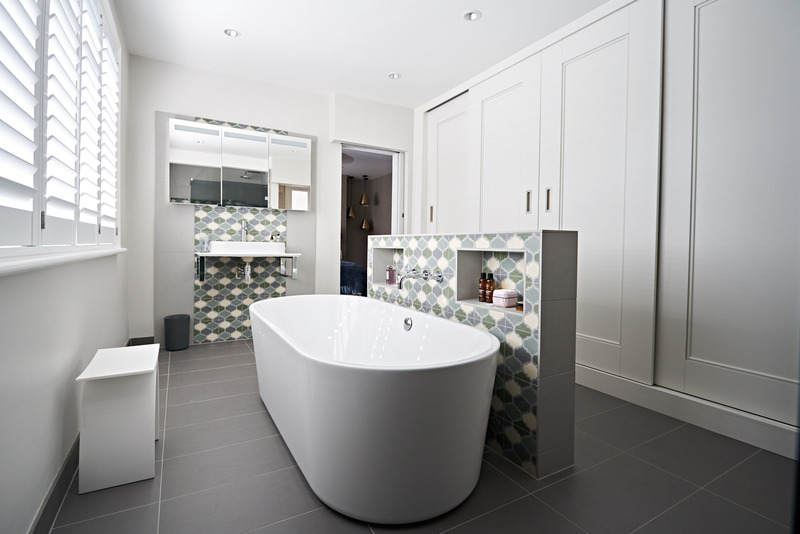 A free-standing bath looks striking across the back of a narrow bathroom or right in the middle of a space. 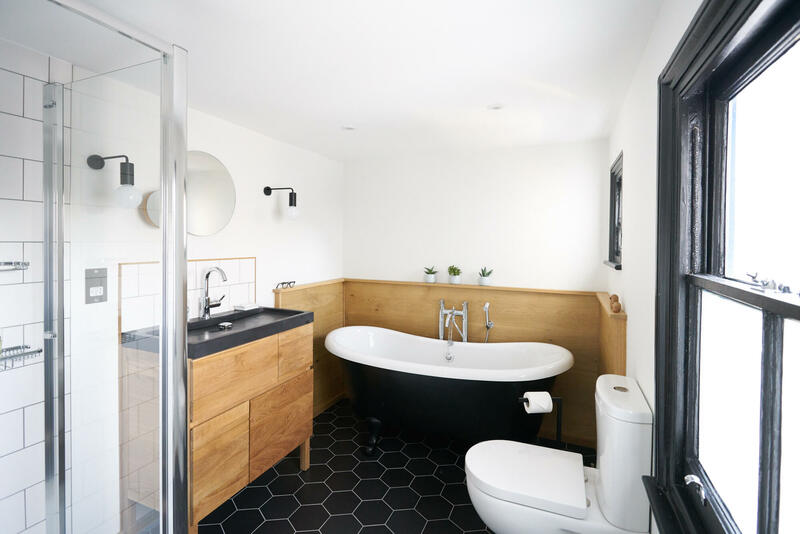 If you’re not sure how to make the most of your small bathroom, get in touch and see how our team of experienced, innovative bathroom designers can help.